L Interdit Perfume & Fine Fragrance - L Interdit EDP, Givenchy Body Products - UK Perfume Guide, Givenchy UK. One of the Givenchy's earliest scents, designed specifically for actress Audrey Hepburn in 1957, L'Interdit perfume is as beautiful and elegant as its muse. 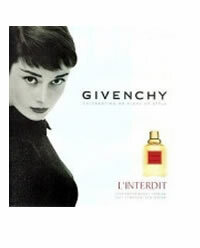 Givenchy L’Interdit perfume owes its name to the actress’s reply when Hubert de Givenchy suggested distributing her fragrance more widely, ‘Mais, je vous l’interdis…’ (“But I forbid it!”). Givenchy L'Interdit is a soft and lasting; light and warm floral perfume that captivates the heart and emerses the soul in a world of elegance, chic and beauty. L'Interdit epitomizes Givenchy's unique mix of French fashion and American spontaneity. Givenchy L'Interdit perfume combines rare and precious essences highlighted by aldehydic head notes, expressing the romantic elegance and feminine seduction. It begins with a chic and understated blend of Aldehydes and Bulgarian Rose over an elegant and sophisticated floral heart of rose, jasmine, violet and pink pepper and a warm, sensual base of iris, frankincense, sandalwood and tonka bean.